A naginatanaoshi style wakizashi attributed to Sue Bitchu Mihara Masaiye. Hawatare: 1 shaku 2 sun 3 bu 6 rin (37.46 cm or 14.75"). Motohaba: 3.03 cm. Kasane: 4.6 mm at the mune. Kasane at the shinogi: 6.9 mm. gunome midare in ko nie deki. Soft, wide habuchi;. There is ha nie, sunagashi, kinsuji, nado. The jigane is itame nagare. 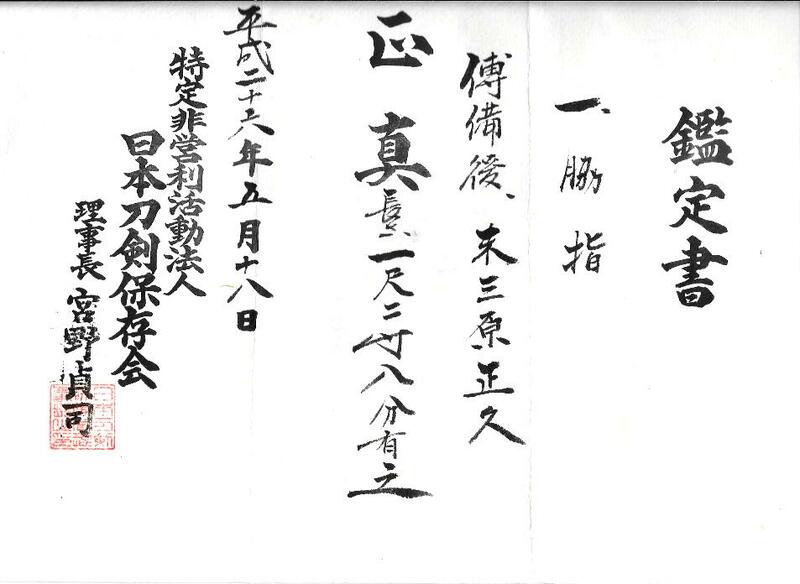 NTHK-NPO kanteisho attributing the blade to Mihara Masaiye working around Temmon (1532 - 1555). The koshirae is en suite Nara shinchu mounts: fuchi-kashira, koiguchi, kurikata, uragawara, and kojiri. The older iron tsuba, has had a shinchu mimi added. The shinchu kozuka may have been made for the mount, or selected because it is a good match. The menuki are high quality, deep black shakudo, of a man in a boat. The saya is in excellent condition, however one of the ito in the handle has broken, and needs attention. 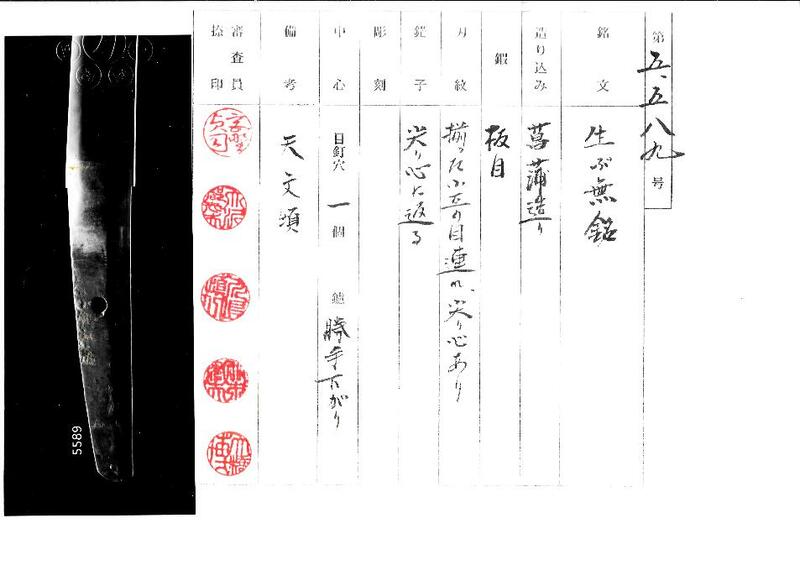 Mihara Masahisa Tensho jidai, (July 1573 - December 1592). Rated Chusaku in Nihon Ttoko Jiten - Koto Hen. Single circle in Nihonto Meikan. Detail of bleached out area in above picture.